Kenya Pipeline will face defending champions and hosts Al Ahly in the semi finals of the ongoing Africa Women Club Championships on Saturday. 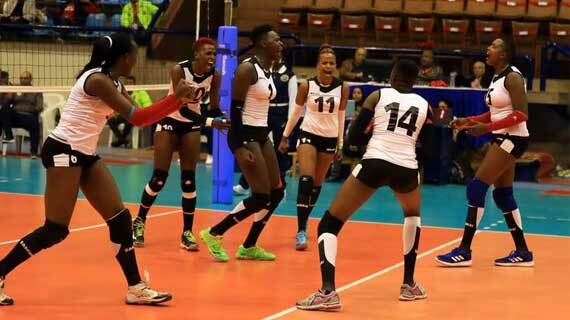 Kenya Pipeline has booked a place in the semi finals of the ongoing Women’s Africa Volleyball club Championships at Ahly Hall in Cairo, Egypt. The former champions will however face tough challenge in the semis as they have been paired against defending title champions and hosts Al Ahly of Egypt. Al Ahly defeated compatriots Elshams in the quarter finals to qualify for the semis. To cruise to the penultimate round of the championships, Pipeline, coached by former international Margaret Indakala eliminated Egypt’s Sporting 3-1 (25-19, 25-27, 25-12, 25-20) in a tough encounter. Though with a considerable amount of opposition, the Kenyan side was first to post intention winning the opening set 25-19. The second set was a neck-to-neck affair with the two sides alternating lead by one or two points and eventually Pipeline surrendered 25-27. After calming down ahead of the third set, middle blockers rookie Gladys Ekaru and captain Trizah Atuka led Pipeline with spectacular performances beating Sporting 25-12. In the last set, both teams seemed to be equally tough but Pipeline trailed at the first technical timeout (7-8). On resumption, it was Pipeline’s turn to be regain control and confidence. The Embakasi-based club gained four points to have an 11-8 advantage. Pipeline, who traveled to Cairo as Kenyan league second runners up then took a 16-11 at the technical timeout and 20-15 lead. Unforced errors from Sporting gave Pipeline a 22-18 advantage but this gap was reduced to 23-20 through bad line judgments by players. Flamboyant and experienced setter Janet Wanja resolved to put to use outside hitter Sharon Chepchumba’s skills and energy to finish the set. Chepchumba, a Kwanthanze Secondary School team alumnus raked in the last two points through touch off Sporting players’ blocks for Pipeline to seal the game victory 25-20.